Over the past four years, I have posted a Five Days of Cinco de Mayo recipe blitz leading up the fifth of May. 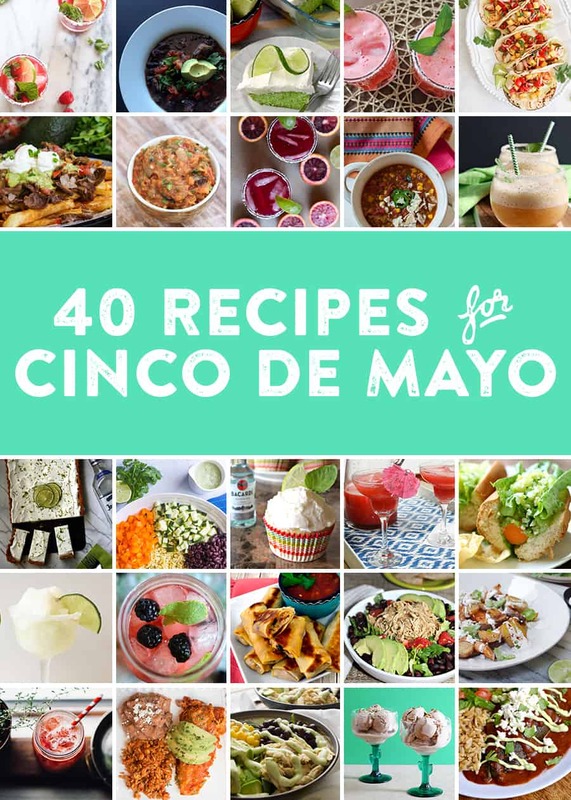 I do not have it in me this year to go to such lengths, but I do have a group of blogger friends sharing 40 Cinco de Mayo recipes today. Let’s be real, who needs five recipes when you can have 40?! My contribution to this party is a tequila lime tart that is a cinch to whip up and a treat to eat. As someone who has no use for tequila outside of a margarita glass, I was delighted to find a use for the spirit in a dessert. Just like champagne is a term reserved for wines produced in the Champagne region of France and bourbon refers only to whiskeys made in America, tequila is a term reserved for spirits produced in a handful of Mexican states, primarily Jalisco. Like bourbon, which requires a mash bill of at least 51 percent corn, tequila also has ingredient requirements. True tequila is distilled only from the blue agave plant. Spirits derived from blue agave in any other areas of Mexico or distilled from more than just the blue agave plant are labeled mezcal. Garden & Gun published a beautiful story about Mezcal a couple of years ago that remains well worth the read today. Who’s up for a tequila tasting? But first, dessert. Enjoy! Prepare the crust by mixing together the graham cracker crumbs, melted butter, and sugar. Press this mixture into the bottom and up the sides of a tart pan. In a medium bowl, stir together the condensed milk, four egg yolks, lime juice, and tequila. In a large bowl, beat the two egg whites until soft peaks form. Pour 1 1/2 cups of the condensed milk mixture into the large bowl of whipped egg whites and use a rubber spatula to gently fold the mixture together. When combined, add the remaining condensed milk mixture and gently fold again to combine. Pour the tart filling into the graham cracker crust. Bake at 325 degrees F for approximately 40 minutes until the filling is slightly puffed and a tester inserted into the center comes out with just a crumb or two attached. Allow to cool to room temperature before topping with whipped cream and lime zest if desired. To make the whipped cream, simply beat the cream and sugar together until soft peaks form. The crust measurements should fit a 9-inch round tart pan or 8-x-12 rectangular tart pan as seen here. The whipped cream topping is by all means up for interpretation. If you want a sweeter whipped cream, add more sugar. Splash in a bit of vanilla for flavor. You might also want to adjust the amount of cream you whip depending on how thick of a whipped cream topping you would like. Mmmm this tart sounds wonderful! So refreshing for a hot summer day.